How stoked am I that Gwen Stefani is now a coach on “The Voice”? I mean, who doesn’t love Gwen?! If you were in college around 1996, the song “I’m Just a Girl” was your anthem. So yes, I’ve been back to watching nighttime TV, just to see her smiling face. Well, as I’m watching, she brings her husband on as help. You know, her husband who happens to be Gavin Rossdale, the lead singer from Bush. Side Note: How pleased are you that a Hollywood couple is still together? I am overjoyed that I get to see Gwen, thrilled they are still married, and on top of that, found some inspiration while watching for my 31 days of writing. Remember the red chord I was sitting on waiting for inspiration? I tried wrapping it around my wrist, but it looked forced. 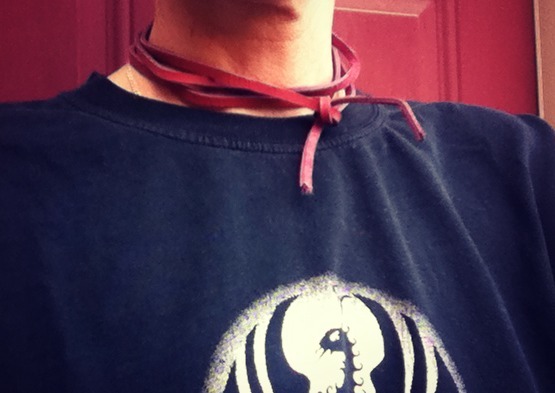 Well, there on TV was Gavin with a red chord wrapped twice around his neck and tied off. It looked so rock ‘n roll. I need a little rock ‘n roll in my life. It needs a little tweaking at the ends, but that might just come with wear. Maybe I need to pull out my old flannels. You never know where inspiration might hit.